Apple iOS 7 has just been announced as the “biggest change to iOS since the introduction of the iPhone” and among the major changes is the completely overhauled mobile Safari browser. The new Safari browser has a brand new tab interface, address bar and gets the option to go full screen. It also finally gets a smart search field in place of the dated two-field layout it used so far. Among the improvements comes a one-tap access to your favorite websites, parental controls and support for the remembered passwords in iCloud Keychain. Working with multiple tabs is somewhat similar to what we have in Google’s Chrome Android browser. You get to see a vertical list of tabs and you can swipe them to the side to discard. Gone is the 8 tab limitation and now each tab has its own preview window. 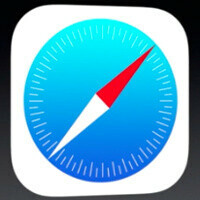 Nice safari icon! (Not!) The URL bar looks similar to windows phone browser URL bar only on top. And lmaooooo the tabs is a rip off of Chrome!!! The tab interface looks beautiful but eerily familiar. I can't quite put my finger on it as to what extremely popular mobile browser has a vaguely similar looking UI feature, though. Might just be some kind of strange deja vu phenomenon. Hate the icon, love the look of the browser. Why do y'all hate on apple so much? Is it really that hard to appreciate something? No. Actually apple is too much innovative and I think this is the reason why everybody hates them. Now look they have innovate the multi-tasking feature. Too much innovation. I don't think people don't like ios7 but the reason there's all these negative comments is apple always say they don't copy and Sue for things like rounded corners etc yet with ios7 you can see so many ideas from other os's which shows the hypocrisy of apple.. I think that's why there is so much negativity. Where/when did they say they don't copy? Steve Jobs repeated Picasso's quote of "good artists copy, great artists steal" back in the 90's. That sounds like an admission of copying. And Apple hasn't sued everything with "rounded corners" just the ones that deliberately copied their designs, namely Samsung. Apple should be embarrassed by their multitude of lawsuits. They appear to be lifting all of their OS updates straight from android and others... in other words, stealing ideas.
" Good artist copy great artist steal" LoL This is just Xerox parc again nothing has change the whole industry is like this. Worst Company ever. Will never own anything by them.